Undefeated at Benito Villamarín since 2009. 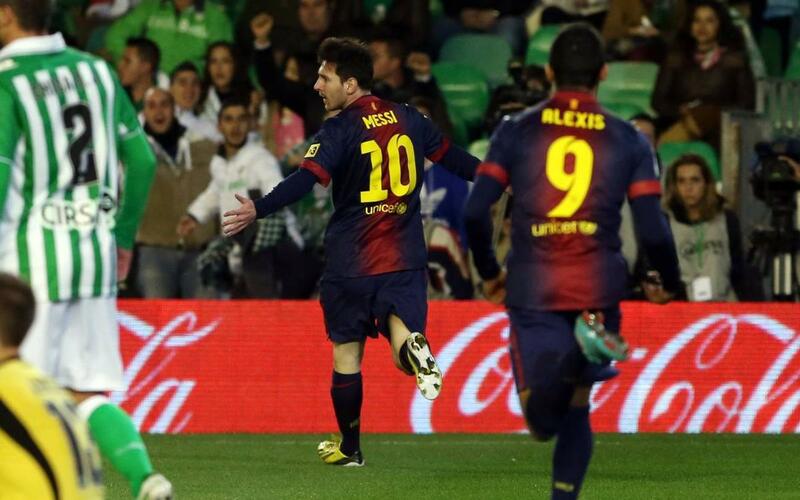 FC Barcelona have a record of two draws and three victories in their last five visits to Betis’ ground. Two 2-2 draws in succession in the 08/09 season and the 11/!2 season were followed by three victories: 1-2 (12/13), 1-4 (13/14) and 0-2 (15/16). The overall record between the two teams favours the blaugranas. The first meeting between the two sides at this ground dates back to the 32/33 season and Barça have played a total of 50 league games there since. The Catalans have a positive record with 21 wins, 13 draws and 16 defeats along with 82 goals for and 62 against. The ‘Quinta del Mini’s great night. On 7 October 1995 one of the most promising groups of players to graduate from La Masia in the 1990s thrilled Barça’s fans. Iván De la Peña, Roger García, Toni Velamazán, Albert Celades and Juan Carlos Moreno put on a show on a night in which Johan Cruyff used 11 academy players. Except for Juan Carlos Moreno, all of the 'quinta' scored a goal in a 5-1 victory which will live long in the memory. Luis Enrique scored a hat-trick just over 20 years ago. Bobby Robson’s Barça visited Villamarín on 19 January 1997. The blaugranas were 2-0 down after half an hour but a goal from the Asturian before the break got them back in the game. In the second half, Luis Enrique added two more to complete the comeback and his first hat-trick for FC Barcelona. Rijkaard’s Barça dominated in the Spanish Supercup of 2005. Betis, who had won the Copa del Rey the season before, were unable to halt this unstoppable Barça side, which went on to win the Liga and the Champions League as well as the Supercup that season. The first leg ended in a 3-0 win for the Catalans thanks to goals from Giuly, Eto’o and Ronaldinho. Guardiola says goodbye to LaLiga as Barça’s coach. After masterminding one of the best periods of the Club’s history, Josep Guardiola decided to bring his spell as first team coach to an end having won a total of 14 trophies in only four seasons. His farewell came on the last Liga game of the 11/12 season at the Benito Villamarín with the fixture ending in a 2-2 draw thanks to goals from Busquets and Keita. Leo Messi breaks another record. Barça’s number ‘10’ became the maximum goal scorer in a calendar year when he bagged two goals in the Betis v Barça fixture of the 12/13 season. The Argentinian attacker managed 86 goals and with this he beat Bayern Munich’s Müller’s 40-year-old record. Messi scored 74 times for the Catalans and 12 times for the Argentinian national team. Lucho is undefeated in his visits to Villamarín as a coach. He has played Betis away three times so far and has come away with two victories and a draw. As Barça B’s coach in 2010/11, with Jordi Masip and Sergi Roberto in his team, he drew 2-2. As Celta’s coach, with Rafinha in his team, he won 2-1 in the 13/14 season; and finally, last year he came home with all three points in his only visit as FC Barcelona’s manager thanks to a 2-0 win. Ten consecutive visits for Iniesta. The midfielder played in the 03/04 fixture and is the only player to have played in every other Barça v Betis game in Sevilla since then. Iniesta's record here reads: four wins, four draws and only two defeats. Cesc scored Barça’s 5,500 LaLiga goal here. During the 13/14 season one of the two goals that Cesc scored against Betis away happened to be goal number 5,500 in the league for the Catalans. Further goals from Neymar and Pedro secured a 4-1 victory.